Big Box Storage is located right off of Miramar Road at 7077 Consolidated Way, San Diego, CA 92121. Despite the convenient location, the majority of the company’s customers never visit their secure storage facility in Miramar. Most fulfill their storage needs with the company’s storage delivery and pickup service. By having a “Big Box” storage unit delivered to their home or business, they’re able to avoid renting/loading/unloading a truck. Portable storage is truly your most convenient option when renting a storage unit – whether in Miramar or anywhere else in San Diego County. The company also provides delivery and pickup throughout the county including storage in Mira Mesa and also storage in El Cajon. Save time and money by having a Big Box delivered to your Miramar address. Pack the Big Box at your leisure and, once finished, it will then be picked up for storing at the company’s above mentioned storage center in Miramar. Each Big Box, which measures 8’x5’x7’ (LxWxH), can generally hold up to 1.5 rooms of household contents. Once in storage, you can access your Big Box(es) any day of the week. The company’s storage rental rates for its Miramar location start at only $64 per month for a Big Box rental. Storage delivery and pickup in Miramar (and throughout San Diego) is also provided free of charge based upon a minimum three month storage term (a $99 savings). 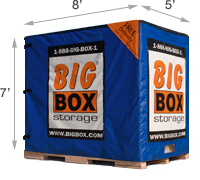 Additionally, customers are pleased to hear that Big Box Storage also backs its rates with a low price guarantee. 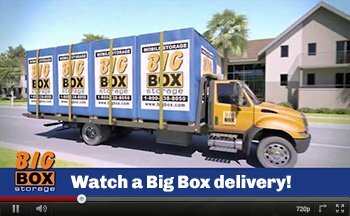 Should you find a lower rate with any other storage company in Miramar – or anywhere in San Diego County – Big Box Storage will beat that other rate by at least ten percent. Schedule a Big Box delivery online today and save $25 instantly. Deliveries can be made any day of the week (including weekends). Company representatives can also be reached between the hours of 7:30am and 6:30pm by calling 858-790-8580 any day of the week.